Last week, my little family and I went for a vacation to Kauai which is one of the islands in Hawaii. As I wrote about here, it is a good idea to get out of the Seattle gray skies and drizzle at least once each winter to keep your sanity – if possible. We have had more sun this winter than usual, but also more cold and a LOT more snow. Suffice it to say that I was really ready to see the sun and to have it be warm. But it was not to be. Kauai is the “rainy” island and we were staying at the “rainy” end of it, but usually that just means that, in the midst of sunny 80 degree days, rain clouds periodically pass by and drench you. I’m OK with that. Our week was a little different. Some kind of storm system was settled over the islands last week and we had colder than usual temperatures, quite a bit of rain, and a lot of wind. Oh, and not much sun. We still had a lovely vacation – we were all together in a nice place and the boys got to play on the beach and even stick their toes in the water. We went to an incredible park with the best play structure that any of us had ever seen. Randy and I got a babysitter one night and went out for dinner. And each night at 5pm, we would venture over to the bar for happy hour and the cocktail of the day. The boys were particularly fond of pineapple and guava juice. We were particularly fond of anything with rum. It was really so nice to be away from our stressful and busy lives back home. It felt luxurious to just sit for a while – and not at the computer! I finished 2 1/2 books and it would have been 3 if I had not chosen Salman Rushdie’s latest. He is a tough read. Now that we are back, I find myself missing the tropics – even if the tropics weren’t that tropical for us this year. I wanted to re-create some of those flavors for my clients this week and found the most amazing soup. 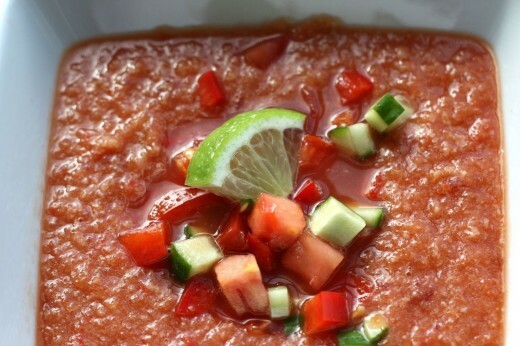 This tropical gazpacho is quite different than the gazpacho I make gallons of each summer. Most of the vegetables, along with some bread, are all pureed together. Here is the kicker – there is pineapple in there too. It may sound weird, but I assure you the flavor is fantastic. The pineapple doesn’t overpower, just lends a slight sweetness and yes, tropical-ness. I would encourage you to taste as you go and what you think it needs. I added additional pineapple and it’s juice, plus more lime. I served this soup with Sweet Potato Roti and Golden Basmati Rice Pilaf. Transfer to a bowl, then stir in the remaining vegetables. Add salt and black pepper to taste. Refrigerate for at least 2 hours and up to 1 day. What a nice way to bring back a slice of hawaii into your kitchen! I think thats the best part of travel – you come back with so many recipe inspirations. I want to like salman rushdie, but just cant. What were the other two you read? My favorite thing about vacations is being able to sit and read for an entire afternoon. Your gazpacho looks wonderful. I hate to ruin that it’s vegetarian, but I’d love it with some grilled shrimp. That’s too bad that the weather wasn’t sunny and warm but it’s great that you were together and still had a fun time. 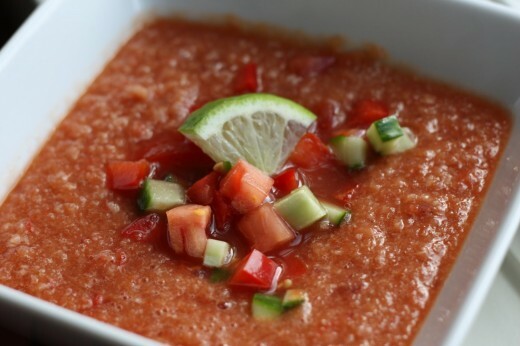 The gazpacho looks and sounds refreshing and delicious. How fun and the tropics did come home with you. Nice.